has three branches in Kansas and Texas. Its small business offerings include business savings and checking accounts, lending, direct deposits, merchant card services, and more. We compiled Community First National Bank reviews and found that it is rated A+ by the BBB and 5 stars on Yelp and Deposit Accounts. Ready to get started with Community First National Bank business checking? Apply now. 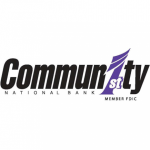 Community First National Bank has two branches in Kansas and one in Texas. Its customers may also access their funds from any CFNB or ultra ATMs at no charge. You may view its branch locator to check which location is closest to you. Community First National Bank also offers the following business services: business savings and money market accounts, credit cards, business lines and loans, commercial real estate financing, SBA funding, and construction and investment property lending. It currently does not offer wealth management. Find out more about its small business offerings on its website.